That’s the kind of comment that usually rises a few (malevolent) smiles: size matters. 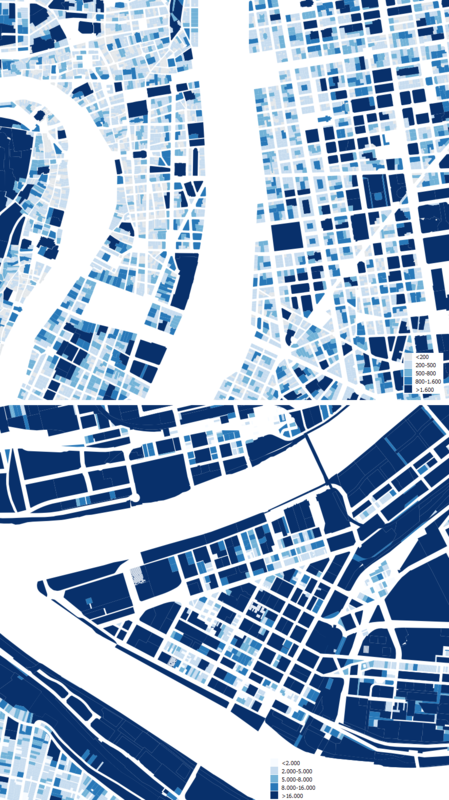 When talking about lot area (relevant as it defines the size of the buildings in plan, and so the urban image), these two cities that have so much in common in “social size” (population at different scales, albeit on rather different physical footprints), show a thing or two. Lyon’s parcels are rather fine when compared with central Pittsburgh, a more recent city in which corporate headquarters and such american features as open air parking (sure, less pervasive than in Houston) change the city. Therefore, a clear difference in “resolution” exists, besides the evident difference in architecture. 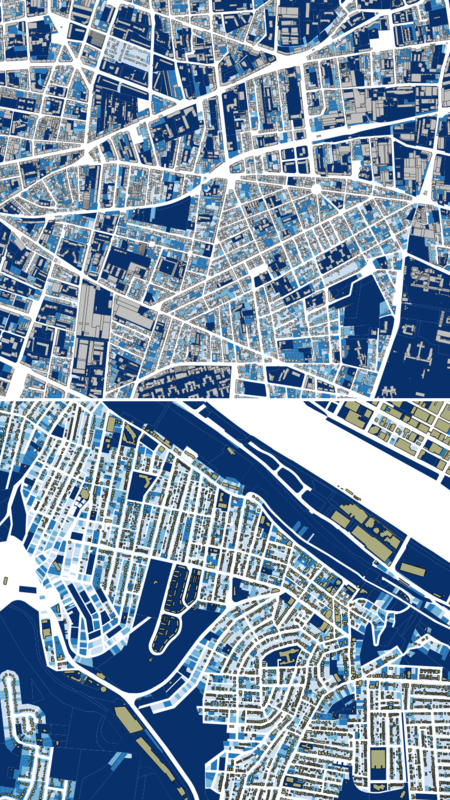 Add buildings, and despite the fact that the cartographic layers seem to have different criteria (we use what we find…), there are relevant similitudes but a clear differnce: the concept of courtyard, much more present (or so it seems) in Lyon. 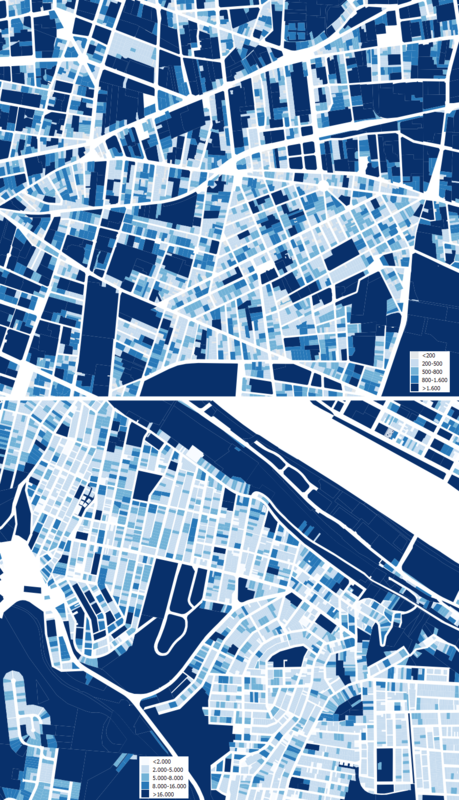 Same scale maps of neighboorhoods near the urban cores: Montchat in Lyon and Mt Washington in Pittsburgh. 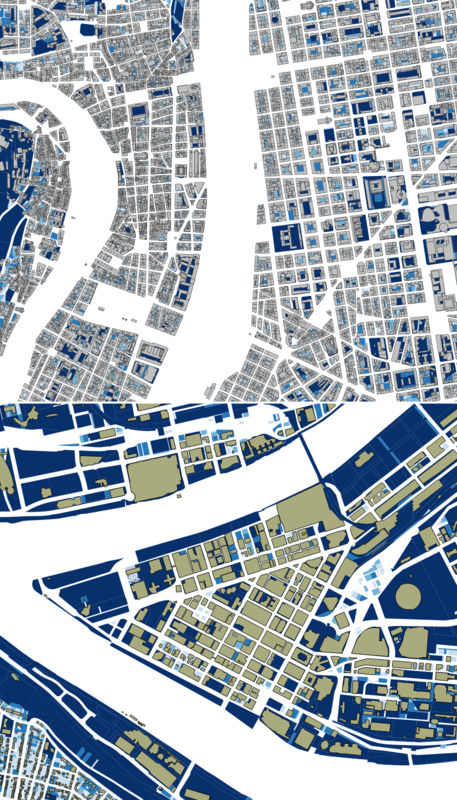 How many dwellings are there in the city? This is one of the most difficult questions. As always, the absolutely accurate answer is impossible as, even when the housing industry is broken and the existing dwellings resist (i.e. Spain today), there is always a building at works somewhere adding some units, or a ruin, or a demolition. The housing censuses were considered to be precise; but today in many countries (Spain included) they are made with a representative sample, not the entire stock. They are made taking account of the cadastre, a fiscal data which is exhaustive, but that sometime does not show exactly what you are looking for (a housing building with a single owner that rents 100 flats can be fiscally registered as a single property, or a parking slot be registered as a housing property). Sometimes a dwelling is divided in many by its owner, without any registration, and the opposite case (grouping neighboring homes) is also possible. As in the rest of the examples of this week, it is always possible to get a figure; what is needed is the knowledge on how this figure was produced, as to be able to relate that to other figures and give it an operational sense. A figure by itself is usually rather unrepresentative. Most of the countries with developed economies can count on a cadastral system. This is not the case of the USA. 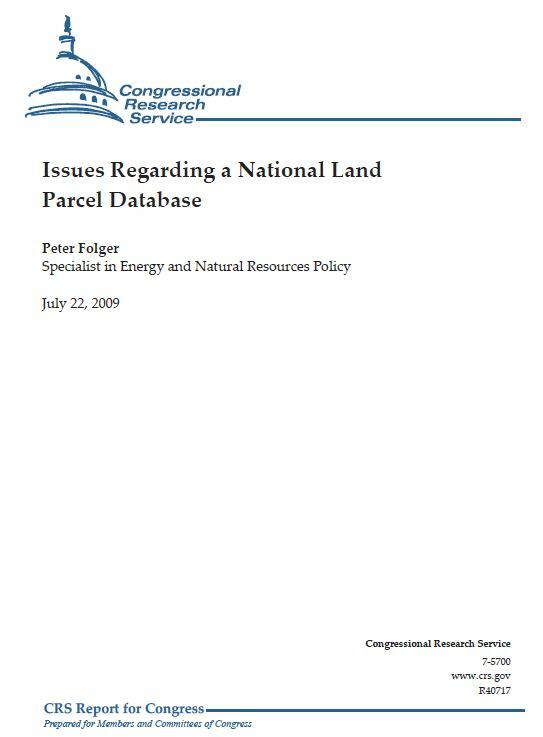 The administrative fragmentation, so cherished since the foundation of the country to avoid totalitarian rule by balancing powers, causes that the access to cadastral data, simple on a nationwide scale in France or Spain, requires local knowledge in the United States. The report by the Congressional Research Service argues that the share of geographical data produced by private and non federal actor is rising, increasing the need for coordination to avoid cost duplication. The most urgent need to implement such a system arises from emergency management (a branch with strong federal involvement), monitoring natural phenomena and climate change, or the real estate crisis and the foreclosure dynamics. Options to organize the system in legal terms are advanced, as well as the potential problems of the implementation of such a system. I wonder if we will ever see in Europe a continental cadastre, taking into account the sheer diversity of our legal systems. 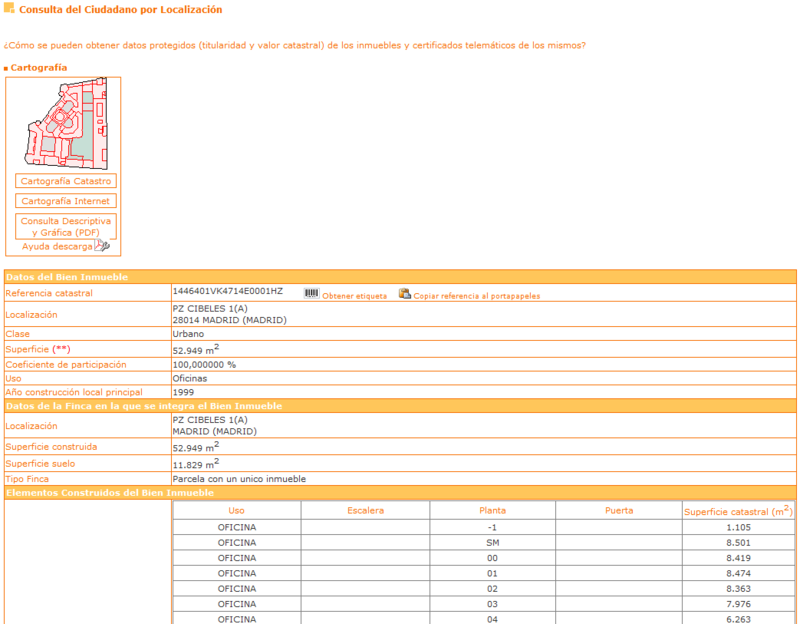 The Spanish Cadastre website allows the access to the general database for the municipalities covered by the system. As the Basque and Navarre provinces enjoy a different fiscal regime, they have their own, independent cadastres. 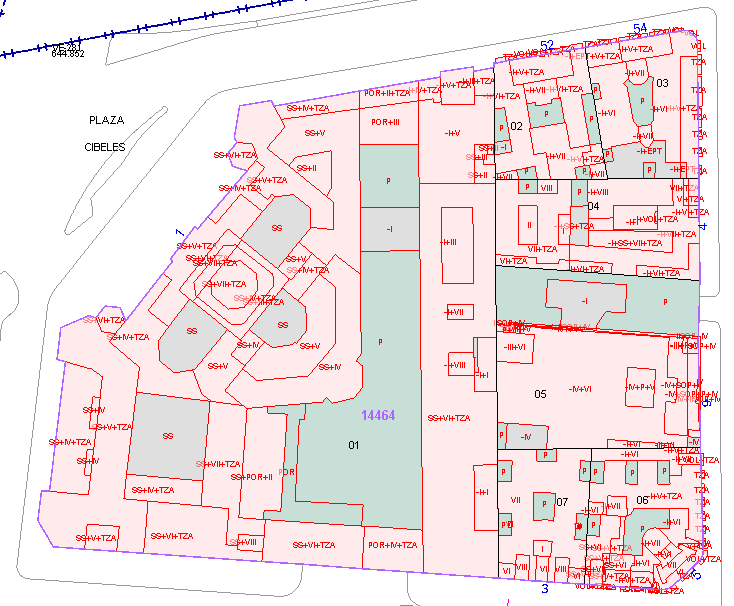 You can access the system through the cadastral reference (a single code atributed to each property) or by a graphic map for each municipality. The system provides information about the buildings in the lot, the internal distribution of uses and areas, and other features. As with any database, there are some flaws, but overall is a pretty good service: for instance, the new Ayuntamiento building was built in the 1910s, but the building date in the database refers to the recent refurbishment. This post is inspired on Flawed Vacant Land Management, posted on Phila Planning Journal. 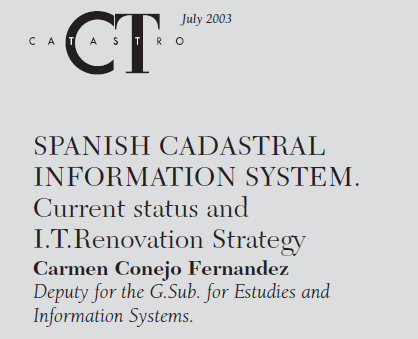 The following lines are a short and somehow simplified description of the Spanish system, but a better description can be found in the Land Registry web, this description of the cadastral system, and the bibliography from the Permanent Committee on Cadastre in the European Union. 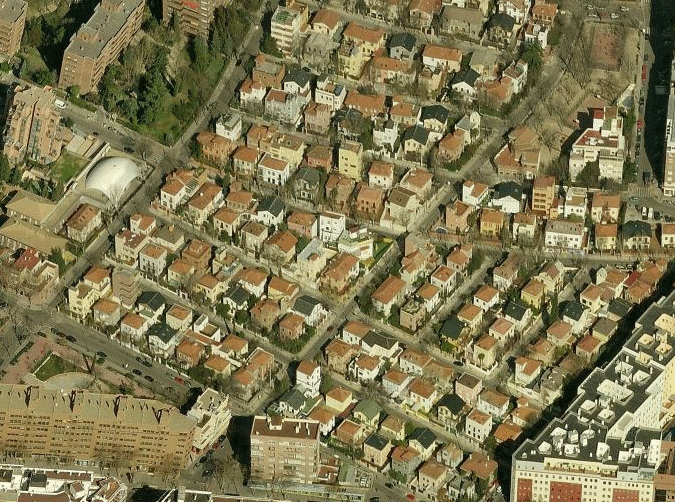 A city is a set of coterminous spaces in which people coexist to diverse degrees. Public spaces belong to everybody, and the coexistence of all is possible under certain community-defined rules. Public space can also be recognized by opposition to private spaces, in which an owner’s right to restrict in a much larger measure the interaction levels is recognized, even if general laws are still to be applied (I.e. your property rights do not allow murder of trespassers). Public properties, despite belonging to everyone, are not homogeneous; they have different owners (state, region, city, administrative units in the above), and distinct statutes. It is not uncommon to see legal systems dividing public property into public domains (for instance streets) and public patrimony (for instance, schools), with diverging sales possibilities. The later have property rights that are similar to those of private properties. Urban planning defines the future limit between public domain and private domain (the rest) by drawing the plot line. This means that planning can define changes to private property in its present form. For some centuries in many countries there have been systems to define the present configuration of private property and how they relate to public ones, with the aim to guarantee the property rights and to raise taxes related to it. The land cadastre, an administrative record managed by the Tax Ministry, in which all urban and rural properties are inscribed, inscription being compulsory and free of charge. Today it is a digital graphical base, used for local property taxes and income taxes. As a free access graphic base it is in growing use. Tax payers are not necessarily land owners. In 2011 it covered in urban areas 13.435.868 plots with a combined area of 1.098.77 hectares. Rural areas had 39.861.294 plots with a combined area of 47.540.978 hectares. The Land Property Registry, created in 1861, which is public and subject to a price. 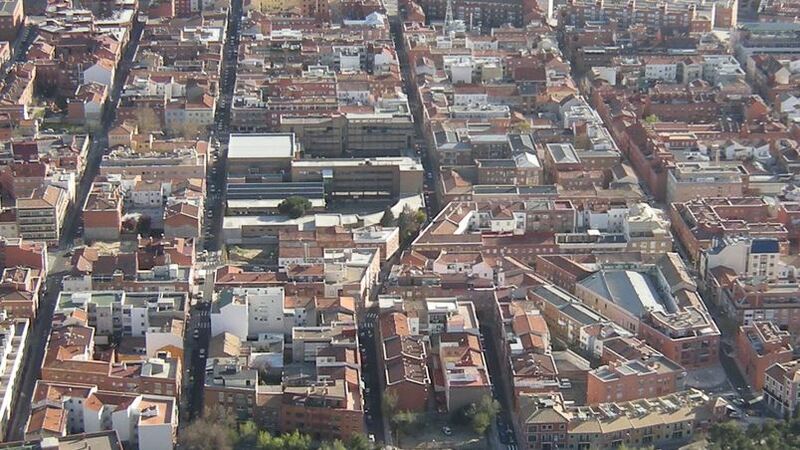 The inscription of a lot guarantees property, but as the description is to often only a text describing the relation with neighboring properties, there can be substantial differences with the Cadastre graphic bases. All conditions applying to the lot, as mortgages, are inscribed in the Registry. So all the land plots in Spain are theretically included in the cadastre, but only a fraction is in the registry. 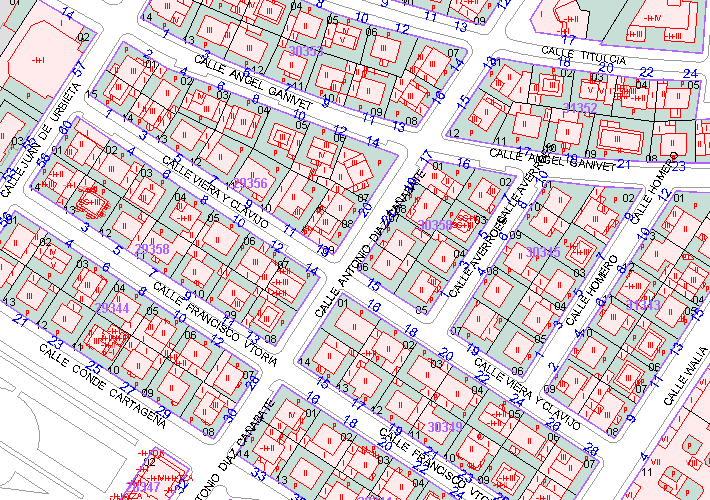 The cadastral database is updated by entire municipalities (or by the inscription of building permits) with some regularity, and the geometry of contiguous land plots is coherente, while the registry is updated each time that an isolated owner asks for it. The cadastral taxpayer is considered secret data, but a citizen can ask the registry for data about the owner and deeds running with the land.